Why is the App Store badge not showing when updates are available? Hi, I'm having some issues with the App Store badge on iOS 7. The App Store icon never shows the badge of available updates even if I have updates. I need to open App Store to know if I have any app updates. If I don't open App Store, updates start to cumulaste since the last time I've checked for them but I still don't get any badge on the icon and it's turned on Notification Center Settings. Did you make sure everything you want turned on is on in settings for this app and in the notification center ? Sent from my iPad Retina using Tapatalk Pro! PS if they are all turned on make sure all your settings in the app are on also. Right now I have 4 showing. The issue it's about the native App Store, not a thirdy app. P.S: Now I've checked on iTunes and there's an update to Twitter but I still don't have the badge on my iPhone App Store to that update. As jaguarr40 said. 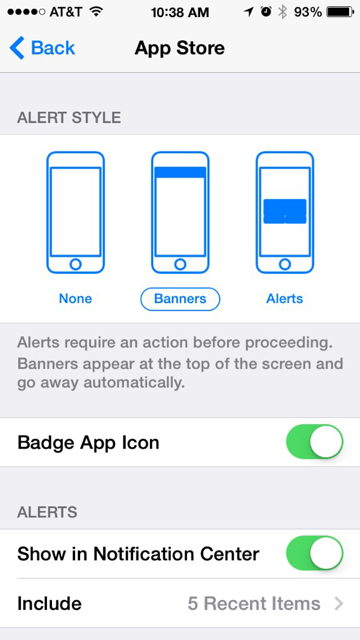 Go to settings>notifications> scroll down to App Store and make sure you've turned BADGE APP ICON on. Even if you've set the other notifications off you still can turn on Badges. Last edited by brunex_1026; 07-16-2014 at 10:32 AM. Yes I've everything configured as it's supose, all badges on and Auto Updates turned off on App Store Settings. Is it possible that your device had not yet checked for updates prior to you manually checking for them, and thus the reason it did not display available updates badge? I get the update badges all the time with the exception of when I read about an update prior to my device actually checking for any and initiate a manual update check. I do not know when or how often it checks for updates. Mine does the same way. I have all the notifications turned on. Updates come in and I usually don't know until I launch the App Store app. As soon as the app opens, the red lights up on "Updates" at the bottom. Then if I close the app, the badge then appears. The badge does eventually appear. But it takes it a long while. It's not immediate. I had wondered about that myself. I do mine manually. Mine has done that forever. It didn't bother me and I never thought much about it. It just did it. LOL. I just opened the App Store app and in 10 seconds 2 updates appeared. It doesn't bother me either. I just check it a couple times a day. It would be nice if it worked the way it's supposed too. It reminds me of the weather app Fahrenheit. The temp icon badge would not update to the current temp until you launched the app. With the App Store, I thought I had something set wrong. Not an issue though. I've everything configured as you do above. Before I get my iPhone 5S (2 weeks ago), I had an iPhone 4S and I've configured my new iPhone with a backup of the old one. On the iPhone 4S even if I won't open the App Store for 2/3 weeks, the badge was showing how many apps I would have to update. So if I backed up eveything and sync it to my new iPhone 5S, it was supposed to be working like it was on my iPhone 4S right? My iPhone 4S was running iOS 7.1.1 so could it be a problem with the new iOS 7.1.2 update? Mines been doing it longer than that. I think it started with iOS 7 and the addition of auto app updates. I do it manually, but it takes a while for the badge to show on the icon. I haven't paid that much attention to it. But I know when I open the App Store, there they are. All you beta users report that. Maybe they'll fix it. Oh I'm not the only one then. The strange thing is that on iPhone 4S I didn't have to open the App Store to know if I have any updates. I've the same configuration now on my iPhone 5S but it just don't works like on my old iPhone 4S, very weird. Do you have auto updates disabled too? I have all auto updates disabled. And you're getting the update badge? No I'm not. The only time I get the update badge is when I manually check. This is really weird because it the same setup now, neither you or me are getting the badge. But before I've sold my iPhone 4S with this same configurations I was getting the badge. The latest iOS I had on my iPhone 4S was 7.1.1 and this started to happen when I get my iPhone 5S that was already running iOS 7.1.2. Or it's was a problem on my old iPhone or it is an issue of this iOS version. I have the same issue. Doesn't really bother me. I try to check daily so that I don't have a bunch of apps that need updated at the same time. Oh, and my badge is turned on. The badges eventually show up. But it takes a long time. In the meantime, we visit the App Store and they show up. If we never went to the App Store, the icon badge would show up at some point. Is there a way to only access the "inbox" of my Work email account? Is there a difference between iphone 5s battery and iphone 5g hook up?